My family has fallen in love with Zucchini noodles! There are so many different spiralizers out there, you should try one! For this meal I used veggie leftovers and shrimp from the freezer. You can use chicken or no meat at all. Typically carbonara has bacon, though I did not use today. Quick, easy and light—great for a weekday meal! I decided to use DiDad’s Passion for Pepper in this dish. It is hand blended from Black pepper, granulated onion, granulated garlic, celery seed and sweet bell pepper. This blend is great on steaks and roasts, or just keep on table and sprinkle it on just about anything you would use pepper for. A glass of Merlot is perfect with this dish! Salmon is one of my family’s favorite things to eat. Today I decided to marinate using Taco Tuesday and tequila. It turned out to have a fantastic flavor and the tequila was a background note that was really pleasant. Taco Tuesday is hand blended from chili powder, domestic paprika, granulated onion, cumin, granulated garlic, Mexican oregano, brown sugar, black pepper medium, and cayenne pepper. 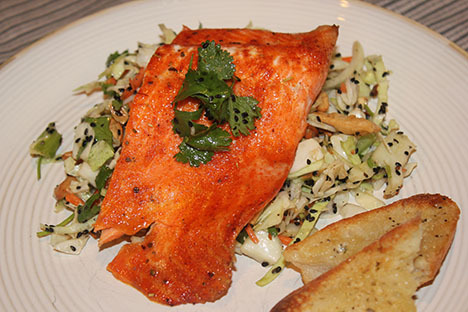 Serve this salmon on a bed of veggies tossed with a Tequila Lime Dressing. 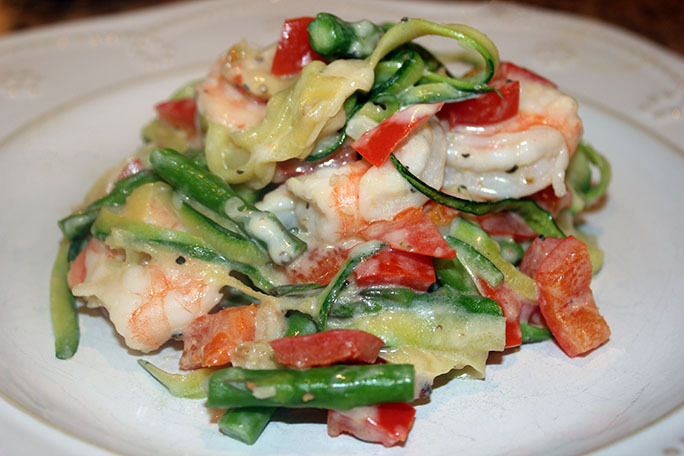 The whole family loved it—great summer dish! I enjoyed a chilled glass of White Shiraz with this salad. Making a stir fry is fun for the whole family. Who doesn’t love to eat with chop sticks? Spiralized zucchini and carrots are a great way to quickly cook veggies. You can also julienne veggies or cut as you wish. 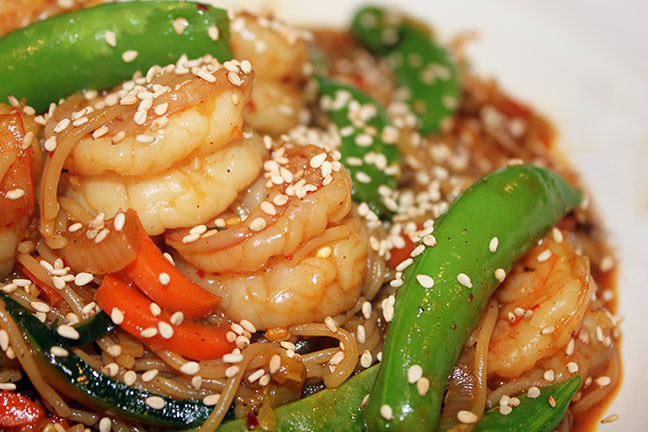 Shrimp cook very quickly, so this is a really easy meal to make. I used rice ramen noodles which only need to soak for a few minutes to cook. Great addition to the spiralized veggies to add the texture and cut down on carbs. Seoul City BBQ is a wonderful blend of demerara sugar, garlic, onion, sea salt, black pepper, sesame, soy sauce, ginger, Korean chile flakes, orange, turmeric and chives. This blend is fantastic on any protein—chicken, steak, pork or fish as well as vegetables. Seoul City BBQ is becoming a family favorite and pantry staple! A glass of chilled White Zinfandel is great with this meal. Eating healthier in the new year! Trying some new things to lighten up some of our favorite dishes. Cauliflower is surprisingly similar in texture to rice and can be substituted for this usually high carb side. Today I made a “risotto” by pulsing the cauliflower in food processor, then sauteéing and adding mushrooms, chicken broth and parmesan/romano cheese. Very flavorful and satisfying. Even my uber-picky hubby loved it. I used one of my absolute favorite spice blends—An Evening in Tuscany. This amazingly flavorful blend is hand blended from garlic, Kosher salt, Mediterranean oregano, basil, crushed red pepper, black pepper, rosemary, onion and parsley. Fantastic on just about anything. 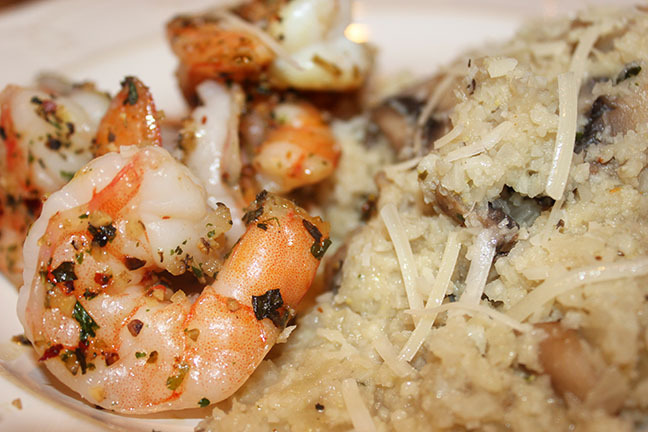 I paired this wonderful risotto with some easy baked jumbo shrimp—low calorie and waist friendly. 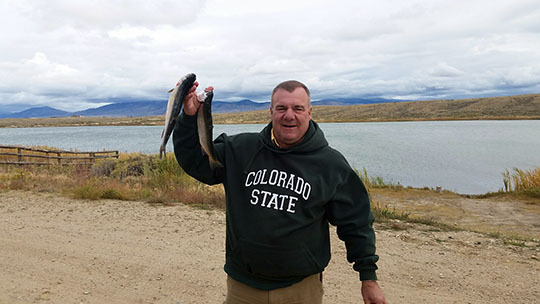 My wonderful hubby went fishing with his brother and they brought back some fantastic fresh trout! There is something so earthy and satisfying about eating what you have grown or caught. 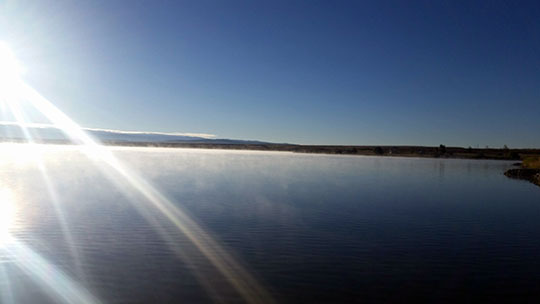 I love living where I live, it's so beautiful! 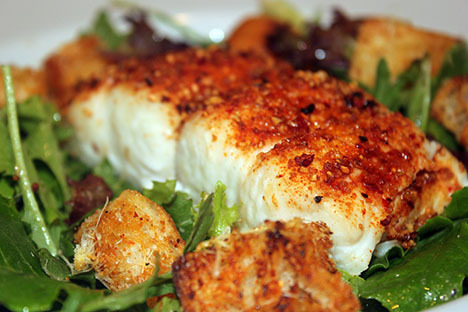 Citrus Sea Salt is made for fish! This is hand blended from sea salt, orange zest, lemon zest, coarse black pepper, lime zest, smoked Pacific sea salt and ginger root. It is fabulous on anything from fish, veggies, chicken and pork. So versatile and truly special. 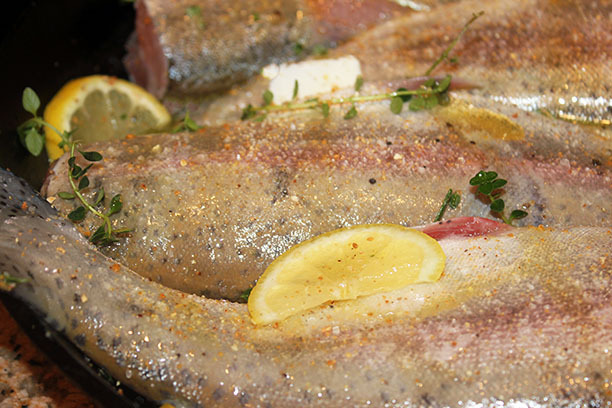 This recipe could not be any simpler and can be adapted to use on any fish. Serve with herbed rice and fresh veggies. We enjoyed an ice-cold glass of Chardonnay with this meal. 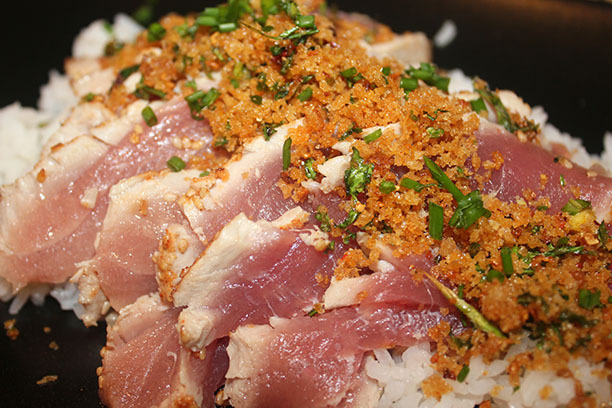 Seared Ahi Tuna is one of the most delectable dishes you can eat. It practically melts in your mouth. Of course I could eat this completely raw. If you are not a sushi fan, you can cook to your liking. I chose to use Big Easy Bourbon Molasses because of its smoky sweet heat. Hand blended with granulated blackstrap molasses, demerara sugar, orange zest, bourbon barrel smoked sea salt, garlic, onion, chipotle, paprika and bell pepper. Amazing on fish, chicken and pork! I found this wonderful Wasabi Arugula at the farmers market. I have never heard of this variety. 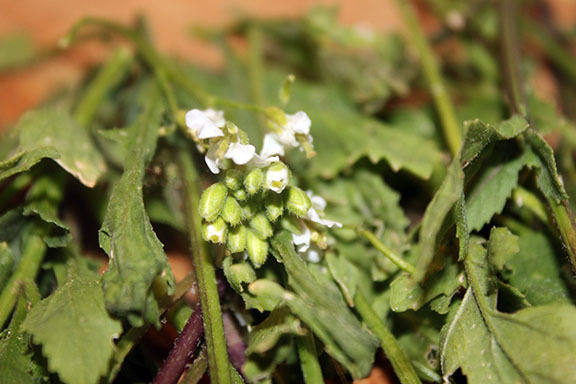 It tastes just like the wasabi you get at a sushi restaurant but without the heat! Fantastic. A gremolata is the perfect accompaniment to use the Arugula in, it adds a nice texture to this dish. This version does not have any cheese typically found in this type of recipe. You can add parmesan cheese, parsley and garlic and use it to top a pasta. Delish! I made sushi rice as a side for this meal—1 cup of short grain white rice, rinsed really well and 2 cups water. Cook per directions and then add 2 tbsp rice wine vinegar, 2 tsp sugar and 1/2 tsp salt that you have mixed together. Stir and you are ready to go! A chilled glass of Pinot Noir paired perfectly with this meal. Posted by Wine & Spice on 6/5/2016 to Grilling Fun! What is there not to love about Honey Chipotle! It has a little sweet and a little heat, I use this on just about everything. The flavor is so fantastic, natural honey marries beautifully with the smoky heat of the chipotle for a combination you can't beat on fish, chicken and veggies! Hand blended from granulated honey, sea salt, chipotle powder, granulated onion, Spanish paprika and Italian seasoning. This salad is so refreshing and perfect for a light meal on a hot summer night. 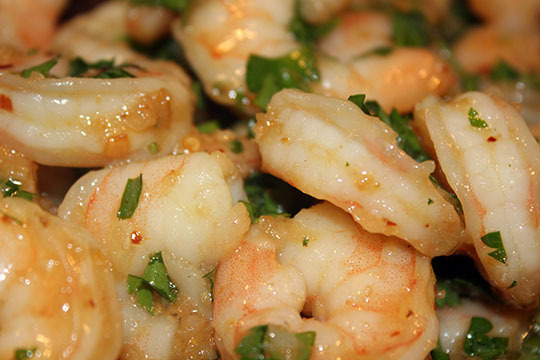 The shrimp can be grilled outside or inside in a grill pan. A glass of chilled Sauvignon Blanc paired very nicely with this salad! 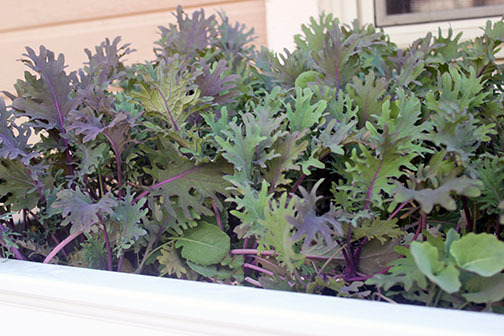 I was so excited to have my first crop of the season—Russian Red Kale! I decided to make a Cod seasoned with the fabulous Habanero Garlic Pepper. It adds such a dimension of flavor. Not overpowering, just a lot of zing on your tongue. The recipe instructions are for the oven, but these are also fantastic grilled—15-20 minutes, medium heat, do not turn over. Habanero Garlic Pepper is hand blended from black pepper, garlic, habanero, orange zest, onion, chipotle and marjoram, this blend gives a bite backed up with lots of layers of flavor. Great on hamburgers, chicken and pork as well. A nice cold Pinot Grigio went very well with this meal. It is always fun to recreate a favorite dish with a different flavor profile. I decided to play around with Shrimp Scampi. Lemon, garlic, butter and wine—what is not to love! I replaced the lemon with Orange Zest and the wine with an orange liqueur. You can use any good quality orange liqueur like Dry Orange Curaçao or Grand Marnier. The sauce this creates is luscious, glistening and so pretty! Using dried Orange Zest adds a richer, more concentrated flavor over fresh zest. As with most shrimp entrees you will want to purchase the larger shrimp. They will have a “meatier” texture than the smaller shrimp. A trick that I recently learned is to “dust” the shrimp with baking soda which plumps them up and makes them more tender. I served the shrimp with pasta tossed in a little butter and parmesan cheese. A glass of Pinot Noir went very well with this dish. Fish Tacos are a staple in our menu rotation. I love to use almost any type of fish, light and healthy. This time I used a beautiful fresh Cod. It has a great firm texture and holds up really well. I paired Fabulous Fajitas with the Cod. This blend is hand crafted from cumin, Mexican oregano, sea salt, red pepper, black pepper, garlic, coriander, paprika, white pepper, cinnamon, rosemary, marjoram, cardamom and basil. This is delicious on veggies, chicken, steak and seafood. 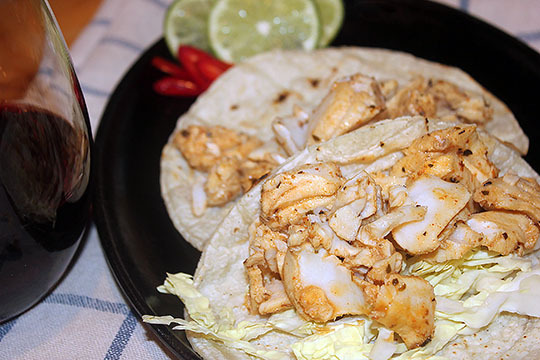 Serve with warmed corn tortillas and a blender salsa… So delicioso! A cold mug of Corona Beer tastes great with this taco! Honey Chipotle has quickly become a favorite in my kitchen. I adore the sweet and spicy (although not hot) combination! It can take the ordinary and make it spectacular. Today I decided to try it on Shrimp and Polenta. So fabulous, such great flavor. It truly makes your mouth sing. Even picky eaters will love the layered flavors. 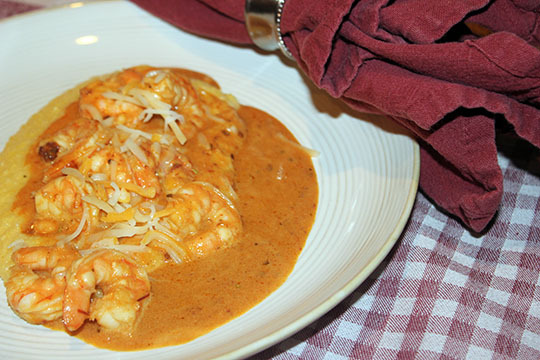 This is a south of the Border spin on a traditionally Italian dish. We enjoyed a glass of Sauvignon Blanc with this meal. With the warmer weather approaching, I generally like to eat lighter. I just acquired the Big Easy Bourbon Molasses and decided to try it on Sea Bass. I am so excited, this seasoning is absolutely fabulous!!!! This is super easy to make and delightful to eat. I served this with a simply dressed salad with homemade croutons seasoned with the same spice. I enjoyed a glass of Pinot Grigio with this salad. 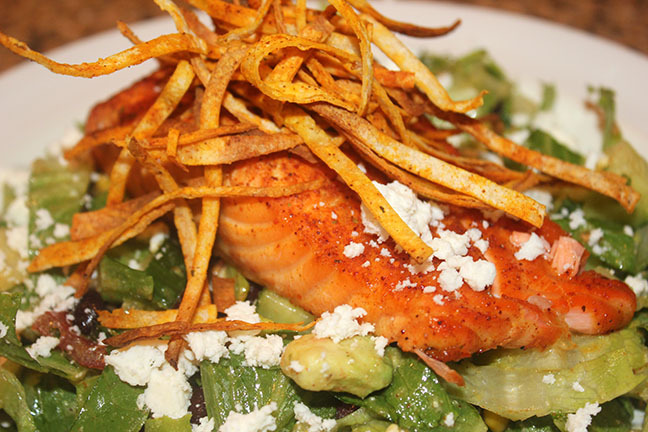 Honey Chipotle is the perfect complement to salmon. It does not get any easier than this! The sweet heat of the caramelized crust is simply the best. My family loves salmon and even those who are not salmon fans will love this. I served this with an Asian slaw. We enjoyed a glass of Pinot Grigio with this meal. It is wet and cold outside and I was in the mood to have something special. 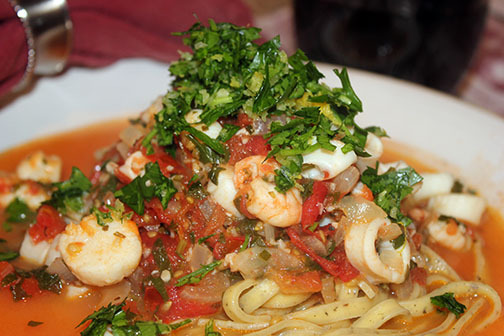 This Tuscan Pasta Pescatore is super simple and quick to make. 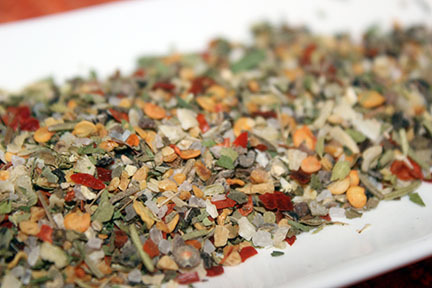 An Evening in Tuscany is my absolute favorite Milford Spice Company blend—absolutely gorgeous! 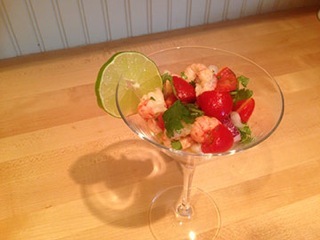 I used a frozen seafood mix containing shrimp, scallops and calamari. You can also add clams or mussels towards the end of cooking and it is done when the shells have opened. 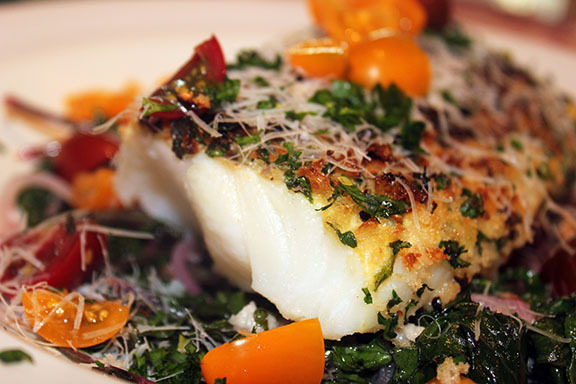 A simple Gremolata tops this dish and really brings all the fresh flavors together. Some crusty bread is all you need to serve this with. We enjoyed a glass of Chianti with this meal. Salmon is one of my absolute favorite fish! 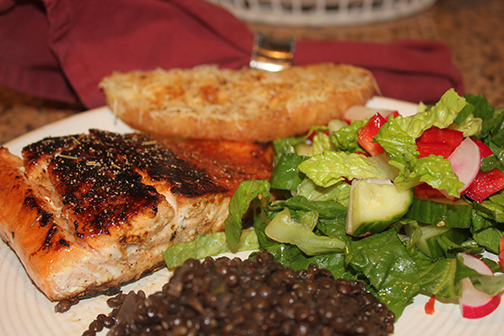 The Honey Chipotle seasoning is THE perfect seasoning for salmon. It adds a sweet and spicy element that is truly out of this world! 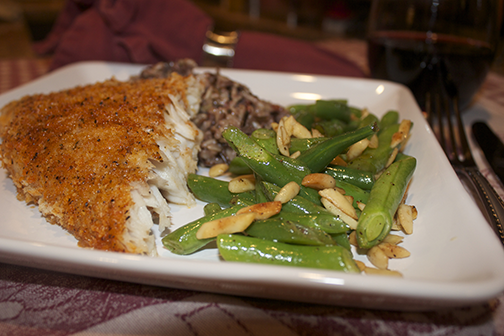 The honey component caramelizes this fish so beautifully! I served the salmon with a light side salad, garlic bread and lentils. This is a quick and easy meal to make that the whole family will love! 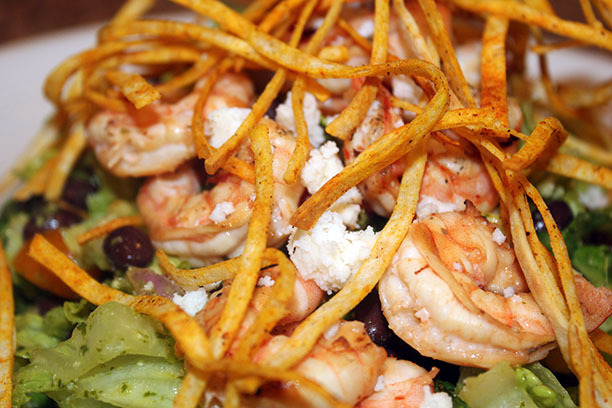 A glass of Pinot Grigio is a great complement to this dish. My family loves fish! Being in a landlocked state the “fresh” fish we get are lake fish. Everything else has been frozen and lacks that “fresh from the ocean” taste. They are great but we miss a good fresh variety. I had never heard of the fish I used in this recipe until now. It is called Silver Corvina and tastes like sea bass. Granted it too was frozen but truly had the fresh taste I wanted. Delicious! This is a quick, easy and healthy meal that the family will love! 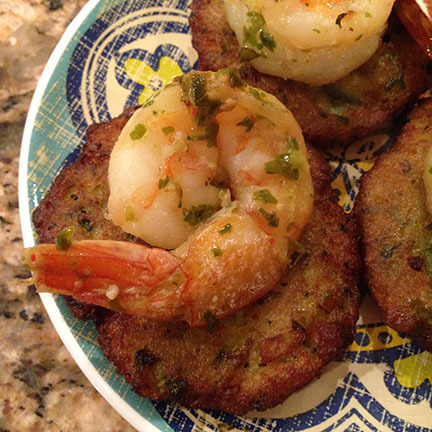 We brought back our oldie - French Seafood Seasoning - so we decided to give Maryland style crab cakes a try. "Restaurant quality" was proclaimed by one of our guests, so we think we may be on to something. They were really delicious, and much easier that I expected. Click on the recipe name to go to the full recipe. Posted by MSC on 1/10/2013 to Grilling Fun! I was in the mood for something light and healthy and a little sweet and spicy. I went shopping around at our local grocery and was disappointed I couldn't find a ripe mango, my first choice. I couldn't find any good looking peaches either, so I opted for two cans of no syrup, no sugar added peaches. But I can't WAIT to duplicate this recipe in the summer when our Michigan peaches come in to season. This hit the spot, definitely a little zip, and we served it over a bed of cilantro cous cous. We will keep this on the short list of favorites. Click here to see the details. 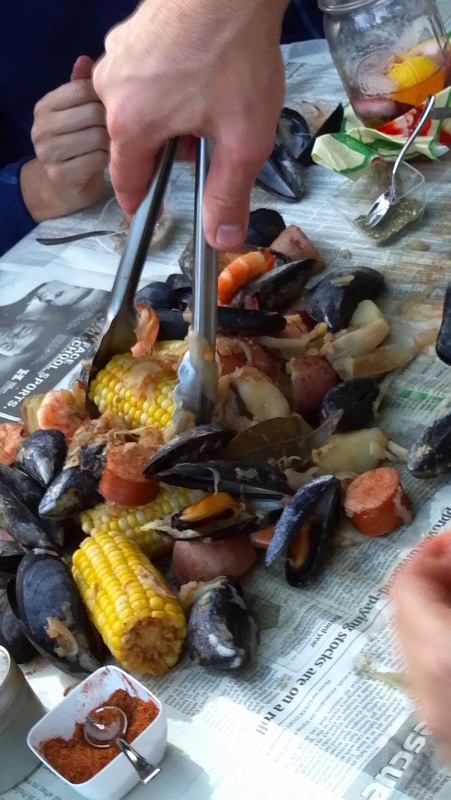 With friends from the east coast, we've been thinking about putting together a proper seafood boil. Though the traditional lobsters were a little too spendy for our budget, I think we enjoyed the shrimp, clams and mussels nearly as much! And the fun part? Tape down your tables (outside!) with newspapers, wash up, and dump all the fixings in the middle. You'll enjoy a delicious treat with your fingers! Easy clean up and silly fun!